I am looking to revamp our diligence proposal. I am going to add in a few examples that we currently use. 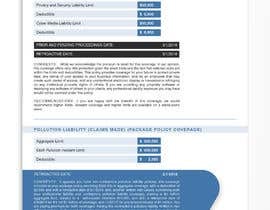 The diligence proposal is used to present to prospects or clients after reviewing all of their insurance policies. We show clients and prospects what their insurance policy covers, what it does not cover, and how we recommend structuring the policies moving forward. We mainly cut and paste the policy language from a PDF, and need the proposal to be static so no one preparing it can change the formatting. Please let me know if you have any questions. Thanks! Please go through Entry #17. I believe it has what you seek. Is it possible for you to break down what exactly you are looking for, seems like everyone has been having similar issues. Once I get the clear idea of what you are looking for, I will definitely be able to help. Thank you in advance. Hello, is there any do's and don'ts you want to clarify in this project we are making for you? Submitting my entry in two days maximum. Thanks so much! The one thing I am noticing is people are putting this into a Folder format. I love the design I am seeing but this "Diligence Proposal" will be printed out in a PDF and the data will change for every client so it needs to be able to be manipulated. Does that make sense? Is there a specific area of ​​the docx files (GCATS Diligenc DO EO and GCATS PC Diligence) that should not be modified? No it can be modified as much as you like. In the new document I want that area to be static so the formatting cannot be changed. Does that make sense? 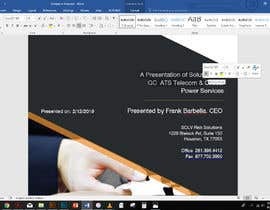 Is it correct to say, you want a single document that combines the powerpoint presentation that informs about your company(SOLV Diligence Deck, currently in pdf) with the other Diligence docs? I have found your feedback very valuable and have promptly gotten to work. My submission(s) will be in soon. If yes, wouldn't PDF submissions be more appropriate instead of the recommended PNG, JPG or GIF formats? I don't really care what format it is in. Thanks! From what I was told, contest holders have little to no control over the file types. Freelancer Support’s contest department is responsible for what file types are accepted as entry submissions for any given contest. which one is the document you want to revamp? I would like to combine the "SOLV Diligence Dec" and the "Diligence EO DO" docs. The "Diligence Dec" piece should be more of a creative story of who we are, and the "Diligence EO DO" pages are the actual audit information/content we are presenting to our client.